Is your Tech-Team getting the blues being stuck in front of their screens 8+ hours a day. Why not have an outdoor team bonding activity that will encourage the inter-team relationships? 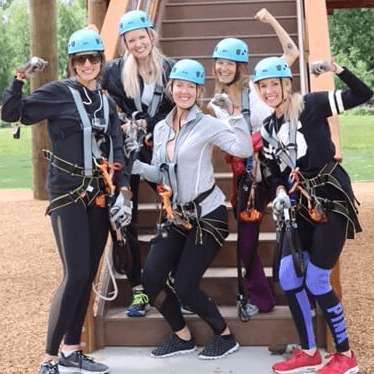 Consider High Trek Adventures, located just 20 min N of Seattle, as the go to place to strengthen team or department morale while having a fun time together! For groups of less than 10, book on our Tickets Page. Groups 10-20, book on our Parties Page. For groups of 20 or more, request a custom quote via the web form below. At a 3 hour event, High Trek Adventures can rotate a group of 120 participants into the course for a 1 Hr climbing and ziplining experience. Prices start at $35 per participant. Regarding food and drink - we have a small store or organizations are welcome to bring their own. We have a tent that holds up to 8 picnic tables - $100 per hr. To view more large group ammenities and options for company picnics and barbecues, visit our Company Picnics Page. If you are looking for more of a team building event with trust and communication building exercises and customized programming for your team goals, then visit our Team Building Page for more details.